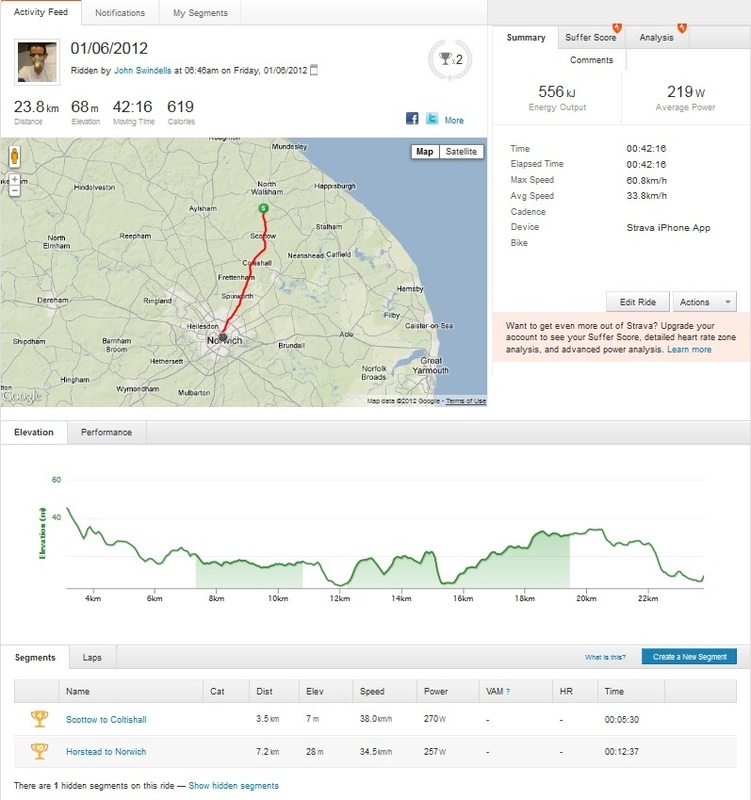 It's hard to describe just how simple and effective Strava is. You will either love it or just not get it. If you enjoy riding your bike or running and aren't fussed how fast you're going or whether you're improving, Strava has nothing for you. However, if you want to push yourself and do lots of commuting, but find it hard motivating yourself to make it a training exercise, then you will love Strava, guaranteed. Basically, Strava is just another cycle computer app for the iPhone that records your journey using GPS. The twist, however, is that your completed ride is uploaded to the Strava website and parts of it (segments) are compared to other people's efforts. Each segment you ride through has a leaderboard, with times and power figures, so you can easily see compare your performance. To see an example of a segment, head over to Constitution Hill, Norwich. By the way, keep an eye out for me! My profile is at www.strava.com/athletes/swinny. So, who creates these segments? Well, you do! When you ride a route and notice that there isn't a segment defined for a nifty (typically uphill) section of road, then it's a simple matter of drawing this new segment. The only catch is that you must have actually ridden the segment - you can't go creating segments anywhere that takes your fancy. After you've created a new segment, a leaderboard is created retrospectively, using previous times that people have recorded through the segment. Just give it a go! The app is available on iTunes - just search for Strava - and the website is www.strava.com: Running and Cycling GPS Tracker, Performance Analytics, Maps, Clubs and Competition. Track all your runs and rides, set personal records and beat your friends' times. Enter virtual competitions, climb the leaderboards, create and join clubs and discover top runs and rides in your area. A big question about the service is whether you should pay for it. The basic service (described above) is free, and right now (June 2012) the Strava Premium upgrade ($6 per month, or $59 per year) doesn't add much on. However, a lot of people (read this thread: What is the point of Strava premium?) consider Strava and its service well worth paying that amount of money for, and that people should pay up if they like it. It's even possible to get more detail on rider performances within a segment, using third party utility RaceShape.com. 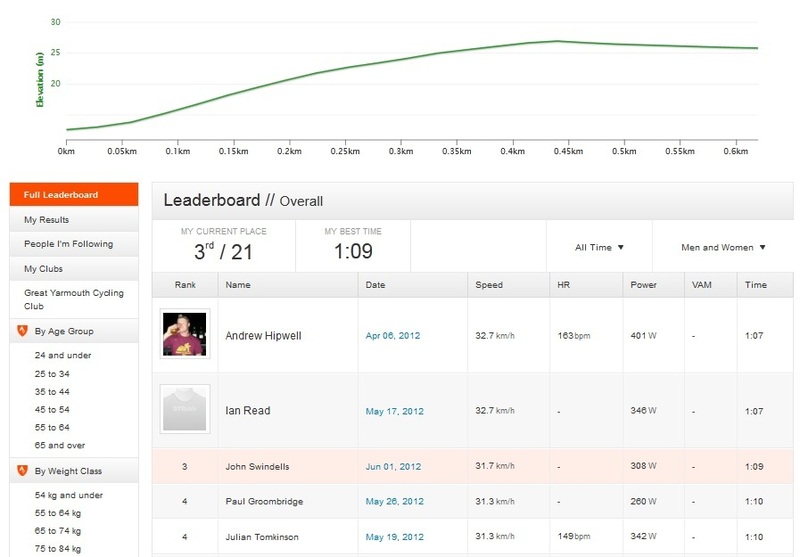 Give it a Strava.com or RideWithGPS.com segment URL and it will show where you are losing time to the KOM (King of the Mountain) on the segment's leaderboard. It definitely encourages you to be obsessive about the more competitive segments, which is great - but make sure that you put safety first and don't ride faster or harder than is safe for the road or for you. It is perfectly possible to create segments that are too fast or dangerous, and a cycling family is taking action against Strava when a member of the family died trying to re-claim a KOM - read more at Cyclelicious and on Road.cc.